Then sixteen-year old Kailey Morgan gets into a horrific car accident right in front of her, and Sera accidentally takes over her body while trying to save her. For the first time, Sera finds herself enjoying the life of the person she's inhabiting--and falling in love with the boy who lives next door. But Cyrus will stop at nothing until she's his again, and every moment she stays, she's putting herself and the people she's grown to care about in danger. Will Sera have to give up the one thing that's eluded her for centuries: true love? I am finding some really great books by Northern California authors which is awesome since I live here. I love being able to read about locations I’m familiar with and Alchemy is no exception! Set in San Francisco, Oakland, and Berkeley I recognized a good amount of the locations and I really felt like I was there with Sera experiencing the things she was. Yes even the dive bar in Jack London Square. I only have two complaints about this book one? It was too short and, two? I have to wait a whole damned year for the next one and with an ending like this I’m chomping at the bit to read more now! What I really loved about this book was even though it was paranormal there was a scientific aspect to it Sera wasn’t immortal because of some magical being like a vampire or a curse science; specifically alchemy was the cause for her immortality and she’s had to move from body to body over the centuries. That idea intrigued me I mean can you imagine? You could be anyone you wanted! That being said I don’t know if I’d want to kill a person’s soul to take over their body. I also loved that Sera had to make herself into Kailey after she accidentally took over her body she really tried to be this girl and learn her life and in that life was a boy Noah and he’s swoon-worthy! Not only that but he’s caring and funny and I fell for him just like Sera did. I hated Cyrus the villain in this he’s just skeevy something about him made my skin crawl but that’s what makes him the perfect bad guy! The passage I chose is after Sera has been grounded and not allowed to go to a Halloween party. Noah shows up unexpectedly. “Was Nicole there?” I ask, biting my lip. “What is your type?” The words are out of my mouth before I can take them back. My heart starts to pound. I want him to kiss me. I want his hands to tangle my hair, to feel his beating human heart against my stolen one. The thought is unbidden, but I can’t say it’s brand new. I also can’t say it doesn’t scare me. 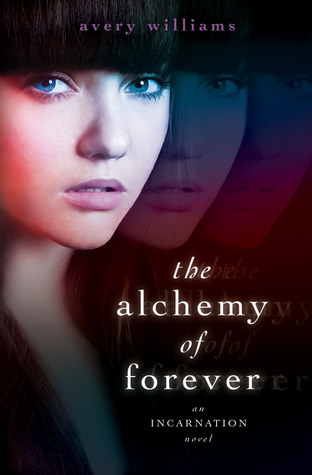 The Alchemy of Forever is out in stores now so go get it at Amazon or Barnes & Noble! Make sure to add it to your Goodreads shelves and check out Avery’s website at Alloy Entertainment. Thanks Simon & Schuster for the Advanced Readers Copy! I loved this book too! Especially the ending! holy snap! i did not see that coming! And i totally agree about the skeeviness that is Cyrus...yet...i didn't completely hate him. I have a bad boy complex though. LOL! NEEDZ NUMERO DOS ASAP! Great Review Jaime!! Awesome quote choice too!